After 10 years at Dens Park, Alex signed for United shortly after he was released by Dundee. He played just a few times and in November 1969, he was allowed to leave to join Montrose as their player/manager. Alex was born on this date in Aberdeen. 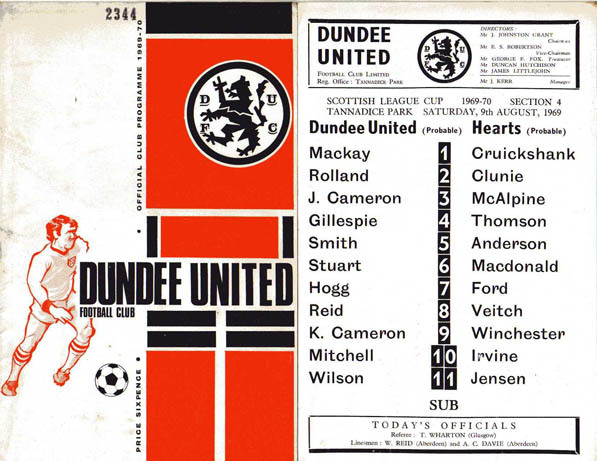 For this League Cup sectional tie, Jerry Kerr brought in Gordon on the right wing in place of the injured Hogg. The tangerines terrors received a rapturous welcome from the Tannadice fans who got a first chance to see the new Tangerine kits worn in Dundee. The sun was shining on a warm Dundee evening for what was United's first home game of the season.